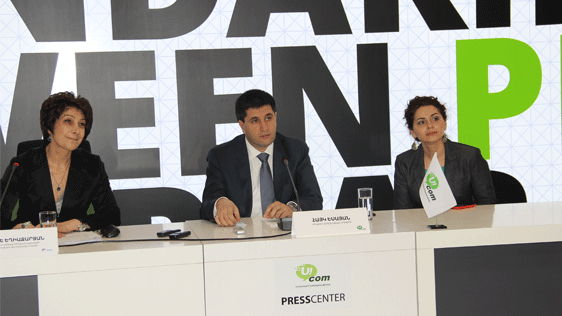 Armenian EyeCare Project (AECP) and Ucom announced today the launch of free ophthalmologic services program in Armenia's regions. Residents of Ararat, Vayots Dzor, Syunik and Armavir regions will benefit from free ophthalmologic services this year. Ucom continues the cooperation with AECP within Bringing Sight to Armenian Eyes project, which Orange Foundation started in 2011. It is anticipated that in 2016, under the project, 13,000 children and adults will undergo examinations. 1,800 people will undergo comprehensive examination at mobile hospital, and 770 people will undergo surgery and laser treatment. A total of 630 glasses will be provided. Besides, children from the regions involved in the project can participate in eye care lectures. At the moment, local ophthalmologists in Ararat marz are conducting eye check-ups. Mobile ophthalmologic hospital will begin its journey in Masis, Ararat this year, where it will stay on April 4-16; it will later be in Artashat on April 18-30, and in Ararat on May 2-14. The next stop is Vayots Dzor marz.